Business premises are such a frequent target for crime that big companies budget for associated losses. For small companies, this is usually impossible, but there are still a number of things you can do to improve your situation. The police are available to assist business owners with crime prevention, and you can take a proactive role to reduce crime in your neighbourhood through surveillance, communication and education. It might seem obvious to state that crime happens in areas where there is crime, but the fact is that criminals are much more likely to operate in an area where they observe that people are routinely getting away with it. Furthermore, run-down areas are like crime magnets. By assisting with general crime prevention in your neighbourhood, you can significantly reduce the odds that your business will be a target. If your area has a neighbourhood watch scheme, bear in mind that such groups are usually open to business owners as well as private individuals. You can also get together with other local businesses to form a business watch scheme specifically aimed at protecting vulnerable business premises. It's important to engage with local people so that they see you as an individual and understand that your business has limited resources - much shoplifting occurs because those responsible don't believe anyone really gets hurt, expecting insurance to cover it. If your neighbours know you personally, they're more likely to raise the alarm when they see thieves in action. If you want your neighbours to watch out on your behalf, you'll have to watch out on theirs. Keep a camera on your business premises (with film in it, as digital images can be inadmissible in court) and use it to take a quick picture if you see a suspicious incident outside. This can also be used for incidents of the sort we don't always think of as crimes, such as dangerous driving. If you see an incident, make a note of the time and outline what you saw so you don't forget it later. You can talk to your local police station for advice on how you can work with staff there to reduce crime. Often the most well intentioned business owners become unwitting accomplices to criminals when they help them to process the proceeds of their crimes. If a customer makes large purchases in cash, they may be trying to get rid of stolen money, and you should make a record of it. You should also be careful about buying goods whose origin the seller can't confirm, even if they're new and even if they're wholesale - shops and warehouses get robbed as well as houses. Remember that if you buy stolen property it may be confiscated from you and you may not be entitled to compensation. Businesses in the service sector can also be used by criminals. Fraudsters often make use of copy shops and internet cafés to cover their tracks, and taxi companies are frequently used to launder money. Be alert to the possibilities of misuse of your own company resources and remember that white collar crime can have a devastating economic effect on local communities, so it's not just thieves and violent criminals who are a problem. Business owners are particularly vulnerable to organised crime, since they're easy to target and can only do so much to protect their business property. However criminals of this sort often rely on being able to pick them off on their own. 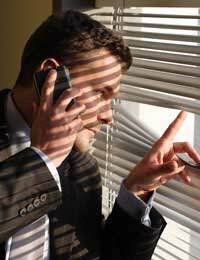 By keeping up strong lines of communication with other business owners you can endeavour to find out if anyone has experienced threats or harassment and you can join with them in taking the matter to the authorities. Organised crime is built up around a form of bullying and your best chance of defeating bullies comes from standing together. As well as dealing with crime when it happens, you can work within your local community to discourage individuals from taking up a criminal career. Business support can make it much easier for young people to get proper education and work experience which will provide them with alternatives. Supporting initiatives aimed at helping drug addicts can help to reduce a major motivating factor behind crime. All the work you do through business enterprise to develop the economic prosperity of your neighbourhood will help local people to lead productive lives, avoiding the pressures of poverty and enjoying the benefits of community.